SW 600 is an efficient model indicator to use with 7,000 lb. load cells or heavier. Use it to export weight, date and time data via RS232 serial to printer or third party software programs. 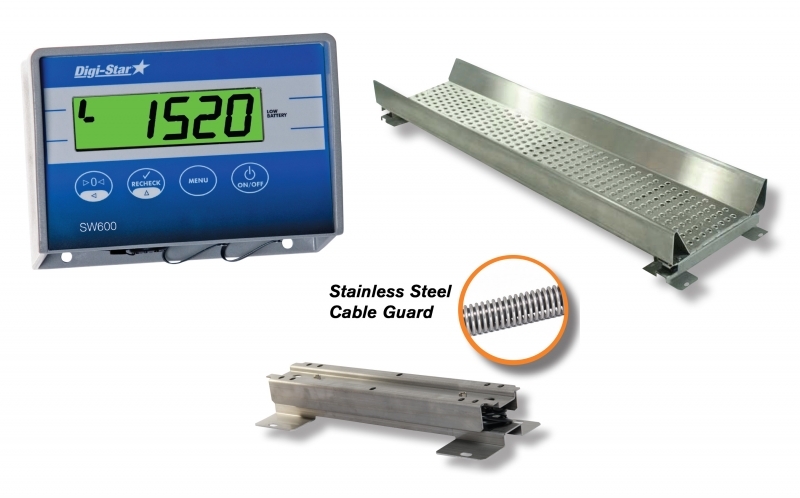 This stainless steel load cell design offers unique, useful weighing results – accurate weight readings on uneven surfaces. The electronic cable is protected with flexible stainless steel cable guard to resist cable injury due to animal biting or accidental pinching, prolonging cable life. 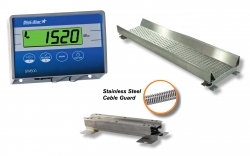 Perfect for producers and 4-H/FFA clubs that may require weighing livestock in multiple locations. This heavy duty walkway platform is lightweight, yet durable enough to avoid flexing under a 2500 lb. animal. The sloped sides offer added strength, while reducing livestock slipping off the sides. The platform’s walking surface features 1” protruded holes to allow debris to fall thru, while offering a non-slip surface. Side horizontal edges feature rolled aluminum, preventing ankle injuries – should an animal step off the side of the platform. Weight when fastened with SW3300-24” load cells: 102 lbs.